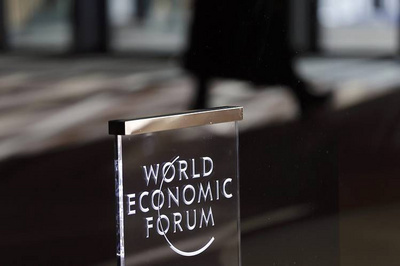 The World Economic Forum (WEF) is a Swiss nonprofit foundation, based in Cologny, Geneva. As a state recognized international institution for public-private cooperation, its mission is cited as "committed to improving the state of the world by engaging business, political, academic, and other leaders of society to shape global, regional, and industry agendas". The Forum is best known for its annual winter meeting in Davos, a mountain resort in Graubünden, in the eastern Alps region of Switzerland. The meeting brings together some 2,500 top business leaders, international political leaders, selected intellectuals, and journalists to discuss the most pressing issues facing the world. The organization also convenes some six to eight regional meetings. Beside meetings, the foundation produces a series of research reports and engages its members in sector specific initiatives. The theme for this year’s WEF, held January 20-23 at its usual home in Davos, Switzerland, was “Mastering the Fourth Industrial Revolution.” If you are unfamiliar with the term the 4th industrial revolution includes developments in previously disjointed fields such as artificial intelligence and machine-learning, robotics, nanotechnology, 3-D printing, and genetics and biotechnology. A Forum report, The Future of Jobs, released at the start of the meeting predicted that this 4th industrial revolution will cause widespread disruption not only to business models but also to labor markets over the next five years, with enormous change predicted in the skill sets needed to thrive in the new landscape. As usual, the world’s rulers from Prime ministers to high government officials to top business men were in attendance at this biggest bash of the year. From published reports, even from the WEF website, it seems that the mood of the participants were somber. “There has never been a time of greater promise, or greater peril,” Professor Klaus Schwab, founder and executive chairman of WEF, said. “As a society, we are entering uncharted territory,” Salesforce CEO Marc Benioff told participants on the last day of the meeting. Less clear, however, is the impact this revolution will have on entire industries, regions and societies around the world. Will it be a force for good or evil? Will it provide new opportunities for all, or will it exacerbate inequalities? Social media, for all the benefits it brings, makes it easier than ever before for terrorist organizations to spread their hateful messages, Sheryl Sandberg of Facebook told participants. We have already seen how the hateful and highly provocative messages in the Internet discussion groups and blogs could lead to the death of hateful preachers, founders and writers. On the employment front, although the WFE has predicted that some 5 million jobs may be lost other experts paint a gloomier picture that there would be a global loss of 7.1 million jobs between 2015 and 2020. How much is a contributing factor like economic inequality for such loss of jobs? You may recall my article – A Second Look at Pareto Principle – that was based on Oxfam report of last year. In that I shared the fact that in 2010, it took 388 billionaires to match the wealth of the bottom half of the earth’s population; by 2013, the figure had fallen to just 92 billionaires. It fell to 80 in 2014. The latest report from Oxfam, “An Economy for the 1%”, now says that the richest 62 people have as much wealth as the bottom 50 percent of humanity — 3.6 billion people. The world’s wealthiest 62 people added US$542 billion to their net worth to raise it to $1.76 trillion from 2010 to 2015, an increase in their composite wealth of 44 percent. Meanwhile, the bottom half of humanity in terms of wealth lost $1 trillion from 2010 to 2015, a drop of 41 percent. The share of the global wealth increase since 2000 that has gone to the top 1% is 50 percent. The richest 1% now have more wealth than the rest (99%) of the world combined. So, what was 80 last year has now shrunk to 62! Nothing probably illustrates the world’s incredible inequality better than this latest Oxfam report. Are you aware that the CEO pay averaged 303 times that of the average worker in 2014? CEOs at the top US firms have seen their salaries increase by more than half (by 54.3%) since 2009, while ordinary wages have barely moved. The CEO of India’s top information technology firm makes 416 times the salary of a typical employee there. Although down from the 376-to-1 ratio of the peak stock-market bubble year of 2000 the current ratio is far bigger than earlier decades. Another way of putting all this in perspective is that CEO pay has risen 1,000 percent since 1979, while typical employee pay has risen 11 percent. The average annual income of the poorest 10% of people in the world has risen by less than $3 each year in almost a quarter of a century. Their daily income has risen by less than a single cent every year. “Growing economic inequality is bad for us all – it undermines growth and social cohesion. Yet the consequences for the world’s poorest people are particularly severe,” the Oxfam report says. The fight against poverty will not be won until the inequality crisis is tackled. Oxfam analyzed 200 companies, including the world’s biggest and the World Economic Forum’s strategic partners, and has found that 9 out of 10 companies analyzed have a presence in at least one tax haven. In 2014, corporate investment in these tax havens was almost four times bigger than it was in 2001. The banking sector remains at the heart of the tax haven system; the majority of offshore wealth is managed by just 50 big banks. Tax avoidance has rightly been described as ‘an abuse of human rights’ and ‘a form of corruption that hurts the poor’. “There will be no end to the inequality crisis until world leaders end the era of tax havens once and for all,” Oxfam recommends. The International Monetary Fund (IMF) recently found that countries with higher income inequality also tend to have larger gaps between women and men in terms of health, education, labor market participation, and representation in institutions like parliaments. The gender pay gap was also found to be higher in more unequal societies. It is worth noting that 53 of the world’s richest 62 people are men. Women hold just 24 of the CEO positions at Fortune 500 companies. Inequality is also compounded by the power of companies to use monopoly and intellectual property to skew the market in their favor, forcing out competitors and driving up prices for ordinary people. Pharmaceutical companies spent more than $228 million in 2014 on lobbying in Washington. The report further states that the financial sector has grown most rapidly in recent decades, and now accounts for one in five billionaires. In this sector, the gap between salaries and rewards, and actual value added to the economy is larger than in any other. In the garment sector, firms are consistently using their dominant position to insist on poverty wages. Between 2001 and 2011, wages for garment workers in most of the world’s 15 leading apparel-exporting countries, including Bangladesh, fell in real terms. Here are some other important findings. Oxfam has recently demonstrated that while the poorest people live in areas most vulnerable to climate change, the poorest half of the global population are responsible for only around 10% of total global emissions. The average footprint of the richest 1% globally could be as much as 175 times that of the poorest 10%. As a priority, Oxfam is calling on all world leaders to agree a global approach to end the era of tax havens. How serious are our world leaders to fix our broken economic system that is widening the inequality and creating global problems in all sectors from migration to climate? Or, more importantly, are they prepared for the job? After all, what we will require is a "holistic" style of leadership, which views today's global challenges as inherently connected, as rightly pointed out by Professor Klaus Schwab. Leadership in the fourth industrial revolution needs to be bold, brave and based on real action and not empty slogans. So long we fail on that account the annual WEF meetings in Davos will only be viewed as a forum for the rich and not the silent majority.